Establish and maintain respectful collaborative relationships with parents/ carers regarding their children’s learning and wellbeing. Demonstrate responsiveness in all communications with parents/carers about their children’s learning and wellbeing. Identify, initiate and build on opportunities that engage parents/carers in both the progress of their children’s learning and in the educational priorities of the school. Parents and community members play an important role in their children's education and a strong partnership between parents and schools enriches the learning experience. To ensure a consistent approach to this communication schools, informed by their state or sector educational bodies, provide policies and guidelines to standardise the way in which school staff undertake this communication. 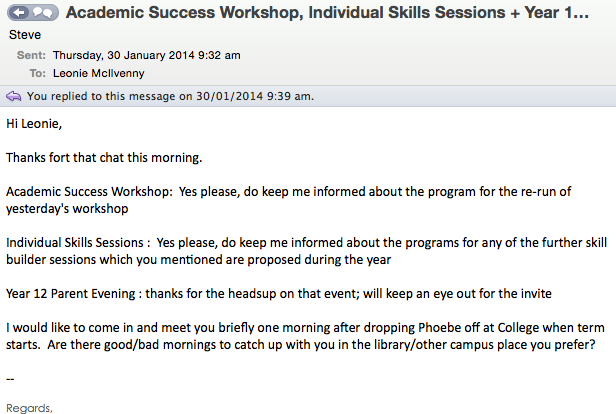 As a Teacher Librarian and Head of iCentre at Iona Presentation College I ensure I am well informed about the communication policies and procedures articulated both by the school and the Catholic Education Office. School Policy on communication to parents. The iCentre uses flyers to promote key events in the iCentre including BookWeek, author presentations, Dress-up days and promotion of services. While the library program is not included in the formal reporting process, the teacher librarians provide valuable information to English teachers with regard to the library reading program. This information is combined with that of English to provide a final mark and comment. Informal communication is provided through emails about overdue books, request to read books in non-standard categories and queries re reading programs. As the Head of iCentre I am often required to talk to parents at special events including orientation sessions, open-days and school tours. 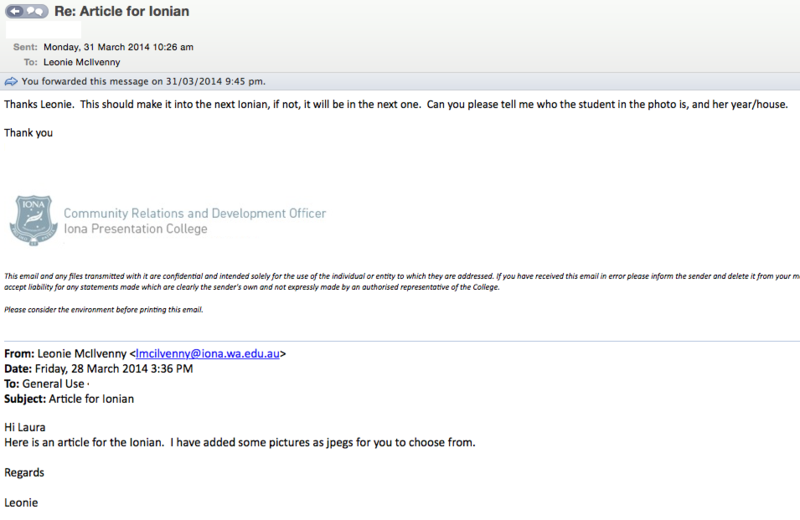 Email with the Development Officer at the school about the next article for parents in the Ionian publication. 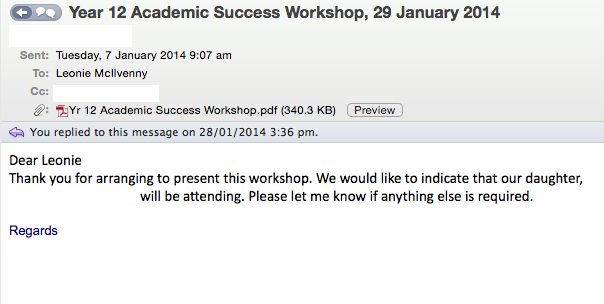 A letter of thanks from a parent for a study skills workshop I organised for Year 12 students before the commencement of school. A letter of invitation to parents for an evening we organised to meet the author Dianne Wolfer. 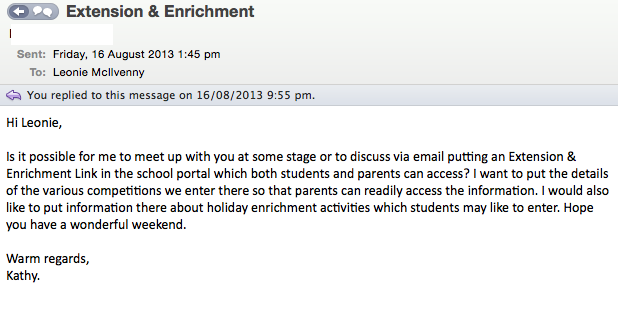 An example of how we are using the school portal to provide important information to parents. A thank you email from a parent after an extensive phone conversation to provide advice on how he could assist / support hid daughter in developing self efficacy in study skills.